The Progressive THINKERS: [SDCPJ] President Trump? No Way! Join us; Attend an important organizing meeting on Mon. May 16 at 7 p.m.
[SDCPJ] President Trump? No Way! Join us; Attend an important organizing meeting on Mon. May 16 at 7 p.m.
Mon. May 16 at 7 p.m.
Donald Trump's hate campaign is coming to town sooner or later. Let's organize for a different future! San Diego is a multi-racial gateway to Mexico and the world. We want a city and nation, which embodies peace, sustainability and social justice for all -- where billionaires can not buy our democracy. We must be prepared to show, the country and the world that we reject the politics of hate and his pledge to make America hate again. We invite you to a discuss the way forward. We propose a multi-ethnic Festival for Democracy in Trump's honor; to draw attention to the treacherous lies, deceit, and his race-baiting agenda. We also prepare ourselves for future coalition organizing towards our progressive agendas. We invite you to attend an organizing meeting on Monday May 16 at 7 p.m. at the Joyce Beers Community Center,* Through preparation we take the higher ground and can be proactive. We call Civic, labor, ethnic, human rights and racial justice organizations to initiate a coalition to ensure the billionaire class gets the message. Donald Trump is now the presumptive Republican Party candidate for president of the United States. Trump has purposely incited anti-immigrant, anti-muslim sentiment, racialized his campaign, and mobilized "white" anger. These are act of demagoguery. Donald Trump has made outrageous statements about his willingness to spread war and destruction in other countries. He is a champion of the billionaire class and will act in the best interest of the 1% if he becomes the president. It is not far-fetched to define Donald Trump's agenda as a fascistic. The definition of fascism is the consolidation of corporate power with the governmental-military power as enforcers. Trump's populist agenda and his pseudo-religious anointment as THE strongman to save a failing empire is classic demagoguery. He has denigrated all of the common rules of decency including attacks on women -- in an election for the highest office in the country. The danger of Donald Trump should not be underestimated. He could become our next president... unless we mobilize. San Diego is proud to be one of the most ethnicity diverse cities in USA. Progressive San Diegans will not support racist, anti-immigrant, Muslim and Mexican bashing. 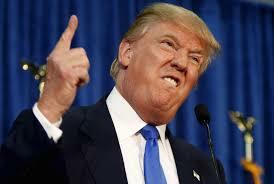 Donald Trump the demagogue is not welcomed to San Diego or the border region! We have an opportunity to turn the Trump fiasco into a victory for progressive forces. Your ideas and participation are solicited. For more info.www.activistsandiego.org/node/5210 or info@ActivistSan Diego.org or call 619-871-9354. Please come yourself and have your organization send a representative. *Joyce Beers Community Center, * 1.5 blocks N. of Univ. Ave on Vermont St in Hillcrest.